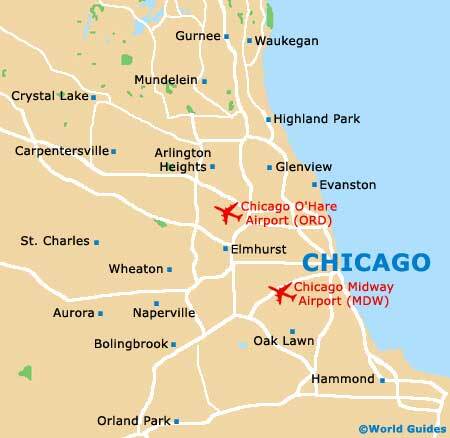 The city of Chicago has distinct seasonal differences and two main factors determine the weather and temperatures in the city. The city is set in the center of a continental land mass, meaning that the summers are particularly hot and the winters very cold, although the nearby lake tends to moderate the weather extremes and adds a level of humidity. Generally the most pleasant times to visit the city are from mid-September to October and from May to early June, when the climate and weather is most pleasant. Spring in Chicago is relatively short, lasting from the beginning of April to the end of May and temperatures are fairly moderate, with frosts during the night. Summer however is however much hotter and June, July, August and September are the hottest and most sunny months in the city. The humidity in the summer is often high, but the cool breezes from Lake Michigan are very refreshing. Evenings can be cool and when attending outdoor events it may be necessary to take a light jacket. In the winter, the Chicago climate in December, January and February can be particularly cold, with some icy days and harsh winds. This is also the wettest time of the year, and snow often also falls in the winter. With average daily temperatures of around 26°C in the summer, the climate is very pleasant and warm. In general, temperatures in the heart of the city tend to be slightly higher than the rest of Chicago, as the heat is absorbed into the large buildings, skyscrapers and concrete. Whatever the weather, there is always plenty to see and do in this part of Illinois. Chicago Weather Charts - further Chicago climate statistics and charts.